Welcome to P.F. Pettibone & Co.
P.F. Pettibone is one of America's oldest suppliers of minute books - in continuous operation since 1896, and has been family owned by the Poggensee Family for the last 55 years. With one-price shipping charges and the best in customer service, it is easy to see why P.F. Pettibone minute books are the choice of thousands of customers across the nation. Customer service is our strength. 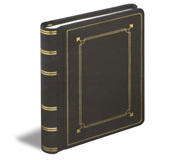 We keep in stock 12-15 different styles of minute books and paper for shipment on the same day you order. Return any stock minute book for full credit within 30 days if it is not what you wanted. We specialize in other record books for city & county governments and school districts. We can ship custom orders, post binders, record binders & plat books in 3 weeks. We also carry a complete line of Law Enforcement supplies & clothing. We items include Patches, Badges, any printed form (Traffic & Non-Traffic tickets, Warning & Courtesy Notices, Parking/Ordinance Tickets) Business Cards & Stationary, Decals, Parking permits, Digital I.D. Cards, Lapel Pins and more. We are very excited about our new 5.11 Tactical Series Line. Any item can be ordered through us at a discount price. Please come visit our showroom. Contact us today! We understand your needs and are here to help you.